what cheerful silent laughter the butterfly makes! 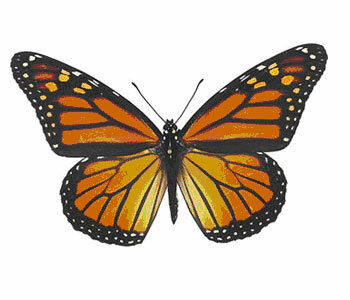 Butterflies are beautiful, dainty and graceful flying stained glass windows! The slightest glimpse of one of these creatures brings immeasurable joy to the beholder. Butterflies are simply revered by children and adults alike. So wouldn’t you love to have a butterfly garden in your own yard? Even if your landscape is already established, if you plant a few of the plants listed below, butterflies will soon find a friendly environment in your gardens. Unfortunately, not all flowering plants will attract butterflies. However, there are flowering plants that are excellent hosts for the butterfly larvae. Other flowers provide nectar for the adults. Different species of butterflies are attracted to different flower nectar and flower colors. The flowering plants that butterflies love can be annuals, perennials, shrubs and/or vines. You can create a wonderful, colorful garden that blooms year round, is beautiful for you and attracts these delicate creatures.